Nokia Corporation stylised as NOKIA, is a Finnish multinational communications and information technology company, founded in 1865. 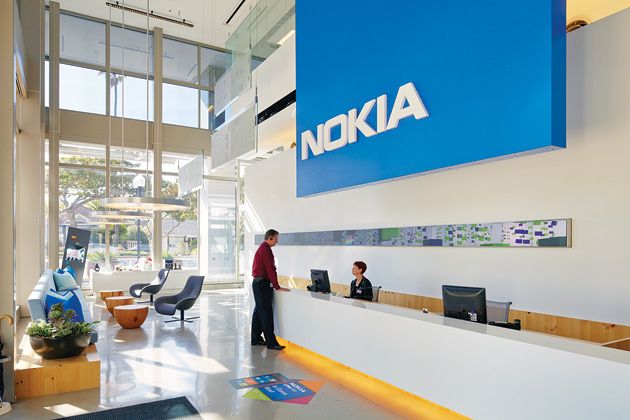 Nokia is headquartered in Espoo, Uusimaa, in the greater Helsinki metropolitan area. In 2014, Nokia employed 61,656 people across 120 countries, did business in more than 150 countries and reported annual revenues of around €12.73 billion. Nokia is a public limited-liability company listed on the Helsinki Stock Exchange and New York Stock Exchange. It is the world's 274th-largest company measured by 2013 revenues according to the Fortune Global 500. The company is a component of the Euro Stoxx 50 stock market index. The company has had various industries in its 150-year history, originally founded as a pulp mill, and currently focuses on large-scale telecommunications infrastructures, and technology development and licensing. Nokia is also a major contributor to the mobile telephony industry, having assisted in development of the GSM and LTE standards, and was, for a period, the largest vendor of mobile phones in the world. Nokia's dominance also extended into the smartphone industry through its Symbian platform, but was soon overshadowed by competitors. Nokia eventually entered into a pact with Microsoft in 2011 to exclusively use its Windows Phone platform on future smartphones. Its mobile phone business was eventually bought by Microsoft in an overall deal totaling €5.44 billion (US $7.17 billion). Stephen Elop, Nokia's former CEO, and several other executives joined the new Microsoft Mobile subsidiary of Microsoft as part of the deal, which was completed on April 25, 2014.